The Redondo Beach Pier seems far more than just a pier, it’s part of a huge complex that contains shops, restaurants, fresh fish markets, amusement games, a large underground parking lot, areas reserved for viewing, and our favorite area—that where the piscatorial minded can fish to their heart’s content 24 hours a day. In addition, today’s pier actually incorporates what was originally two distinct piers. 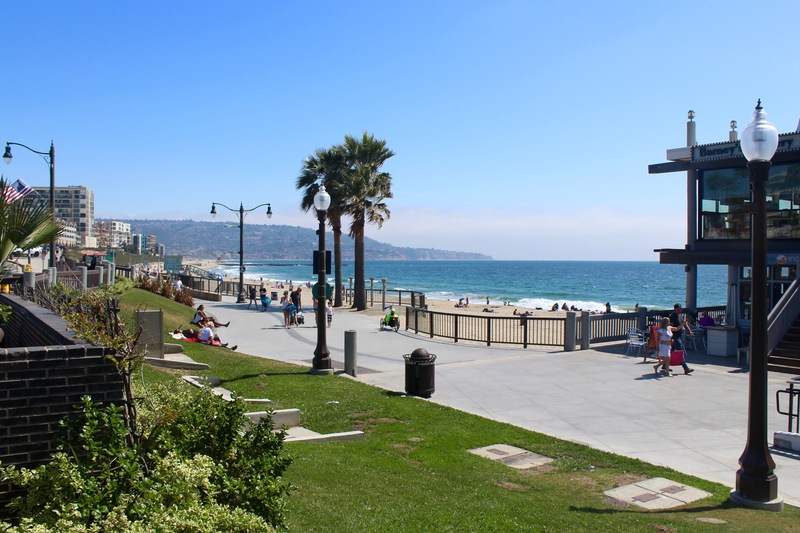 The first is the beautifully rebuilt Redondo Beach Municipal Pier. Its shape, which resembles a large horseshoe, explains the name affectionately bestowed upon it by many locals—the “Horseshoe Pier” (although some anglers like the simple Ol’ Dondo Pier). An alternative name used by locals is the “Endless Pier” since the pier loops back on itself (and a famous predecessor pier back in the ‘20s was given that name). Connected to the Municipal Pier on the south end is the smaller 300-foot-long Monstad Pier, a pier dating back to the 1926. Initially the pier was a private “fishing pier” reserved for pier anglers and those using the boats of the Monstad Sportfishing fleet. However, it wasn’t long until the Monstad’s began allowing other businesses onto the pier, i.e., fresh fish markets and bait and tackle shops (like the ‘50s Fisherman’s Haven). 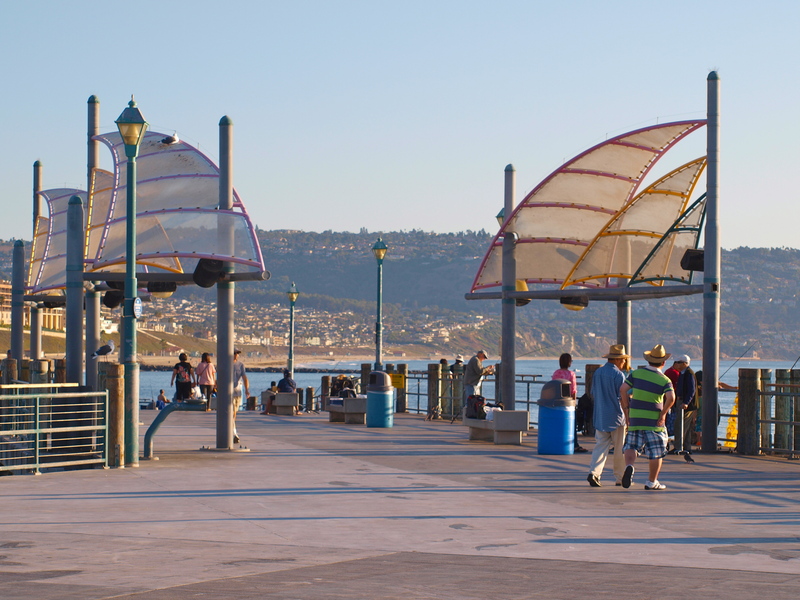 Today, the outer side of the pier is reserved for fishing while the inner side mainly contains restaurants (including the Redondo Café & Bait Shop). Of note is that while most of the pier’s surface is concrete, the Monstad section has somewhat rough wooden planks in tribute to the original Monstad Pier; the planks can be a little hard on those in wheelchairs. In March of 1964 one additional name was added to the mix. It was announced that the city councilmen and the merchants on the pier had agreed that the pier should have one name, preferably Fisherman’s Wharf. Today all of the pier businesses still carry a Fisherman’s Wharf address. For many, myself included, the name muddies the water. You have a name like “Redondo Pier” or “Ol’ Dondo Pier” that can be trademarked and promoted versus “Fisherman’s Wharf” which, to most people, brings visions of San Francisco or Monterey. The pier is big and you can expect a crowd on most days. 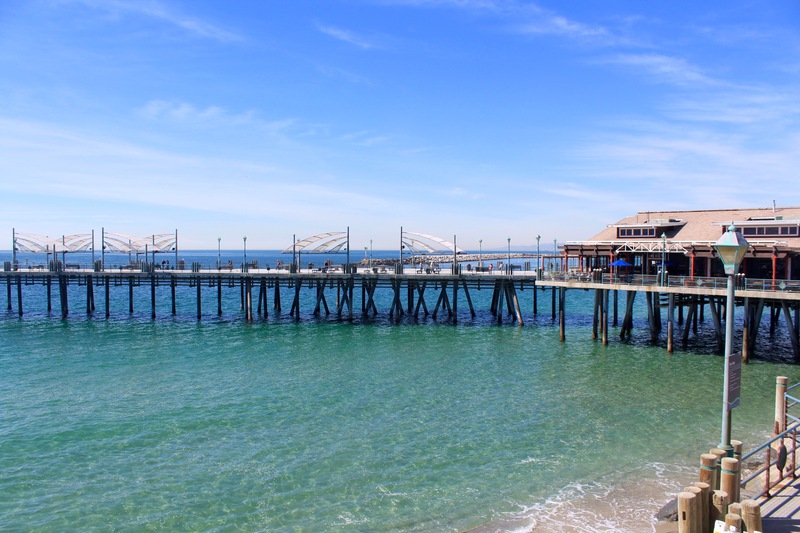 A survey released in 1990 by the California Fish and Game Department reported that the Redondo Beach Pier was the highest visited pier in the state with an estimated 4 million visitors a year. 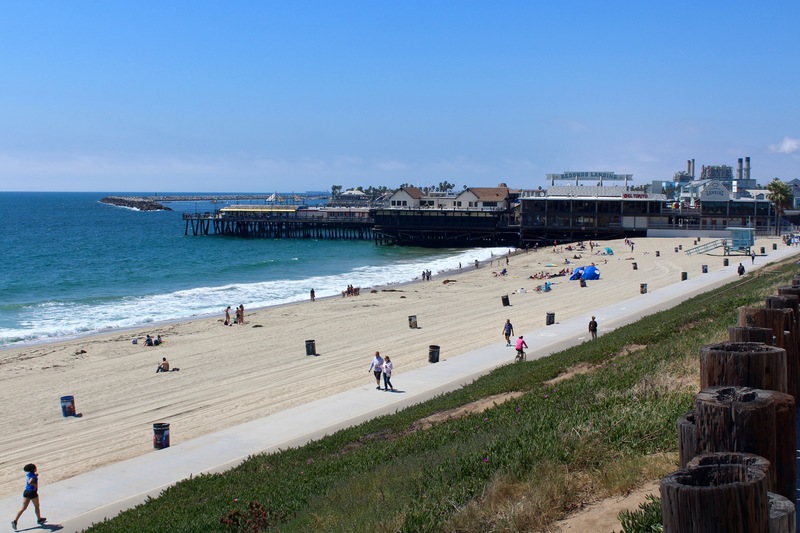 Ranking next in order were the Santa Cruz Wharf at 3.5-4 million, Santa Monica Pier at 2.5-3 million, Stearns Wharf in Santa Barbara at 1.6 million, and Fisherman’s Wharf in Monterey at 1.5 million. A common denominator is that each is a large multi-use wharf/pier that contain a variety of attractions—restaurants, shops and in some cases amusement areas. 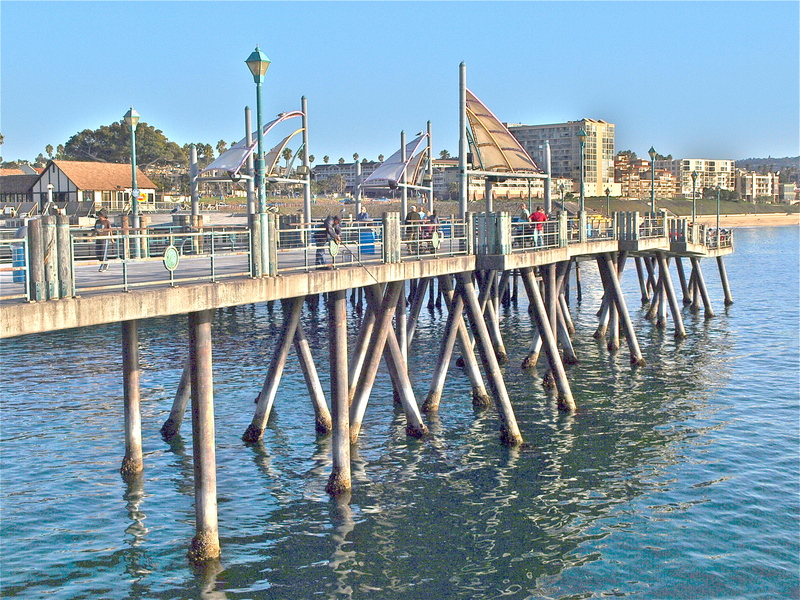 The highest fishing only pier was Pismo Beach at 1.5 million (although I am confident that the Oceanside Pier would have exceeded that figure if it had not been closed and under reconstruction during the survey). 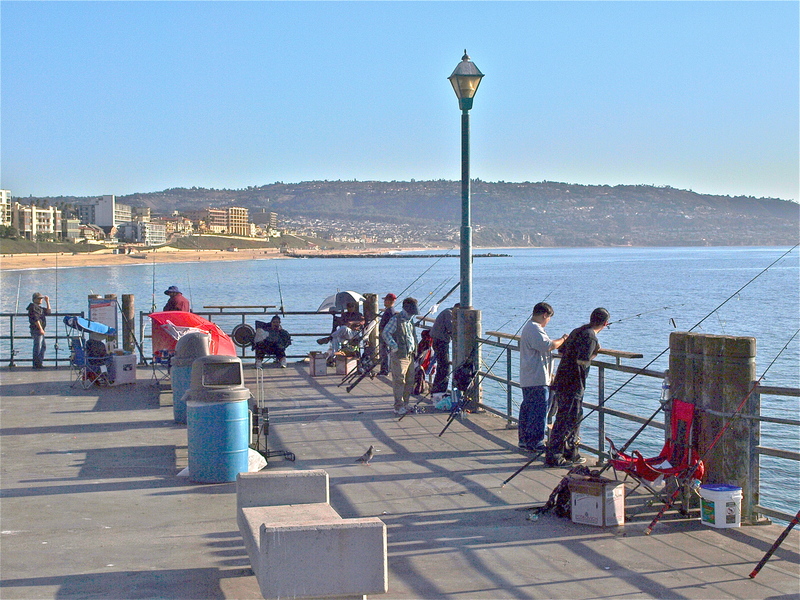 The fishing crowd is huge at Redondo but as at the other multi-use piers anglers are only part of the mix. 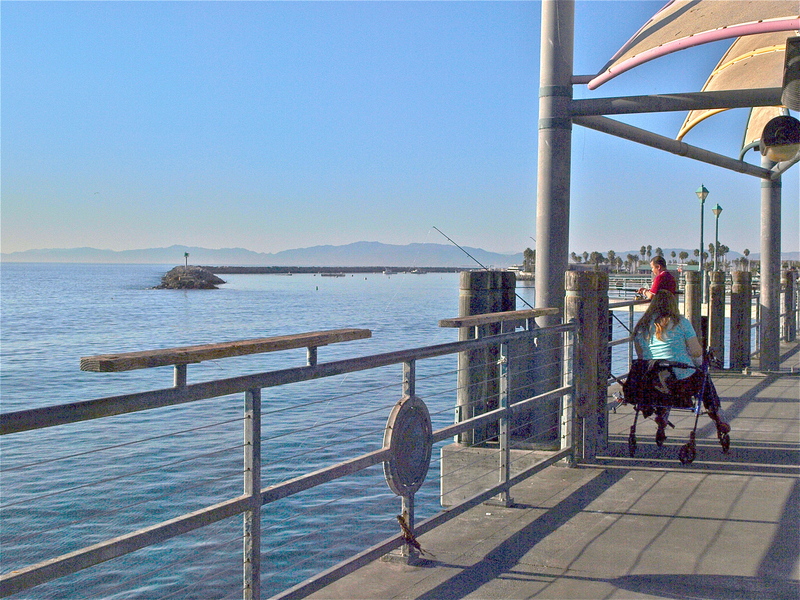 In fact, one of the main attractions of the pier is simply its diverse, eclectic nature. There are numerous restaurants, many ethnic in nature, as well as an “International Boardwalk” filled with a number of different shops. There is also an unending mix of different nationalities and whole families camped out on the pier. The mix of restaurants, shops, and games on the arcade makes it a great family venue while the ample parking makes it an easy destination. Some sections of the pier have an almost Coney Island-like feel to them (or perhaps a county fair feel). Window after window are filled with the specialties of the place, lots of fried food specialties (mainly seafood), giant corn dogs, corn-on-the-cob, funnel cake, hot dogs, hamburgers, pizza and a lot of churros. Mexican food? Of course, including a nice El Torito restaurant overlooking the sea. For anglers, the fish markets filled with a mix of seafood, everything from fish to crabs, lobsters, scallops, shrimp, mussels, sea urchins and more, are always interesting and those craving seafood should have no problem finding something they like. I’m always ready for some fresh steamed cracked crab? Agreed, it may not be the place for the local “hotty toddy” crowd. No, this is a pier for the hoi polloi—the common people. And for the “pier rats,” the hoi polloi of the angling world. Did someone mention crowds? Sometimes you have to watch out for the sheer number of people on the pier. Anglers rolling pier carts and their rods down the walkway, mothers with baby carts, so called power walkers, rollerbladers, cyclists (who have their own lanes but don’t always stay in them), skateboarders (who are usually closely watched), and people more interested in checking their cell phones than in watching what is ahead of them. You sometimes need to be a “defensive walker” on a crowded weekend. The pier complex is not perfect for everyone but it is fun for most people, a fact which seems somewhat amazing given today’s “judgment a second” social media that seems to generate more negative review than positive. The Municipal Pier itself is listed at 1,550-foot-long but because of its horseshoe shape it actually does not reach that far out into the water and has the feel of a shorter pier. It sits fairly high off the water, 25 feet, but it’s a small price to pay for protection from winter surf. 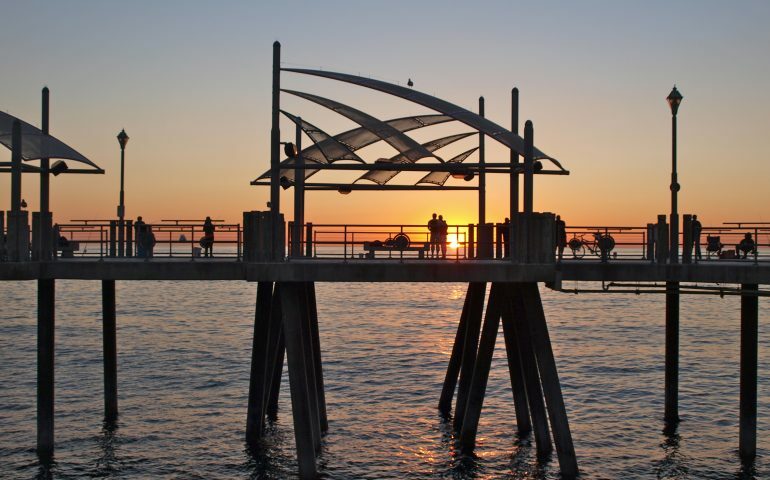 Although the wide and sandy Redondo State Beach begins just at the base of the Monstad Pier (and heads south), little in the way of a sandy beach environment is presented to anglers. Here most of the beach is hidden under the complex of shops on the pier and angling for the shallow-water surf fish like croakers and perch is generally only fair. The exception is the Monstad Pier section where anglers can fish from fairly shallow to moderately deep water. The mid-depth water holds most of the halibut and helps explain why the Monstad Pier was long considered a premier pier for halibut. The pier itself is not only a beautiful pier but also one of the best-designed piers, from an angler’s viewpoint, that I have seen. Especially thoughtful are the bait cutting platforms located every few feet along the railing. Now, if someone from Huntington Beach would just pay a visit! Something added in the past decade was a larger fish cleaning station, one in which the scraps are sent to the sewer instead of into the ocean. The fishing isn’t as good but it does serve the 21st century requirements imposed by the state (as if fish and crabs are not going to eat cut-up pieces of fish). Environment and fish. 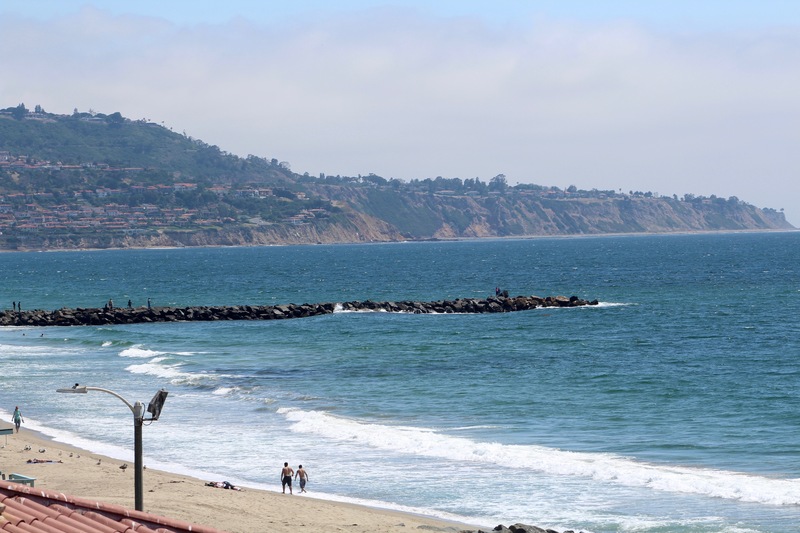 What distinguishes Redondo from most other piers is the deep-water Redondo Submarine Canyon that curves in fairly close to the pier. The end area itself offers exposure to this water. Pelagics such as Pacific mackerel can be thick and indeed the pier is probably the top “mac” pier in the L.A. region, producing mackerel when sparse elsewhere. The macs are joined by jack mackerel (Spanish mackerel), jacksmelt, and sardines (some years); at times, the water will be unbelievably thick with several different species. The good news is that the smaller baitfish (aka food) can attract larger game fish such as barracuda (generally at night) and yellowtail (generally late summer to fall), especially in El Niño warm-water years. 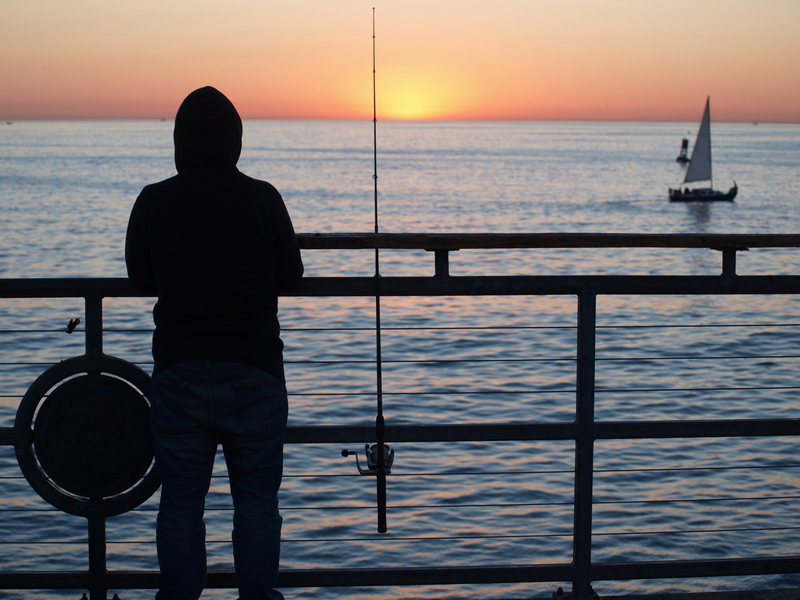 The pier may also be the top “bonito” pier in the area during warm-water years although the nearby Redondo Sportfishing Pier may see a greater fish per angler average. Decent-sized sharks, guitarfish and bat rays are also fairly common. 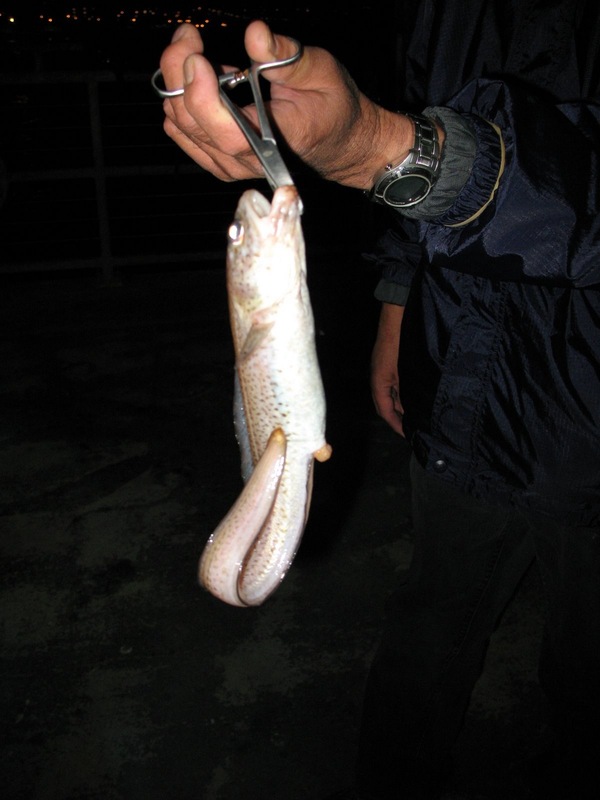 Due to the deep water in the canyon, the pier also at times yields an unusual variety of fish including occasional catches of deep-water fish like hake, sablefish, sanddab and cusk-eels. His reference to triggerfish, a fish more common to Baja, was interesting since an early F&G record for triggerfish concerned two finescale triggerfish (Balistes polylepis) taken from the pier in June of 1951. Several more triggerfish have been reported to the PFIC Message Board.